A Music box for the Hummel Collector! 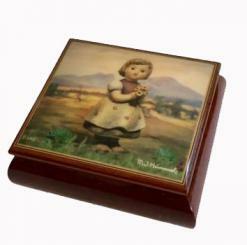 A Hummel "Little Girl with flowers" graces the lid of this box in decoupage. From the Artist series by ARS, and Ecolano this sweet box measures 5" x 4.756" x 2.75" and plays "Love is a Many Splendored thing"."